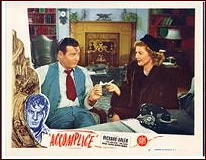 » Movie Review: ACCOMPLICE (1946). Lash was my least favorite Gruber sleuth — I’m much more of a Johnny Fletcher fan — but damnit, I still want to see this bad review and all. Arlen had been a big star for about ten minutes — WINGS, BEAU GESTE, THE FOUR FEATHERS (note, not the famous versions of those last two) — often teamed with his buddy Mr. Mary Pickford, Charles ‘Buddy’ Rogers, but this is actually pretty late in his leading man career even though he continued as a character actor for much longer. He’s not exactly my idea of Simon Lash, but not terrible casting. 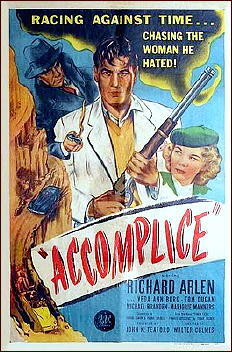 Gruber had much better luck with his westerns on screen than his mysteries. Maybe they were just too plot heavy. In any case I prefered him in his Eric Ambler mode in books like BRIDGE OF SAND, THE SPANISH PRISONER, or BROTHERHOOD OF SILENCE. 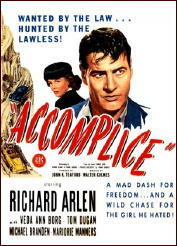 He did write a damn good police procedural, THE LAST DOORBELL as John K. Vedder and good none series private eye novel TWENTY PLUS TWO which was made into an intriguing but cheap little film with David Janssen and Jeanne Crain. 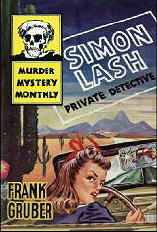 My reaction to “Simon Lash, Private Detective” was the same as David’s: didn’t like it as much as Johnny Fletcher, or Gruber’s non-series books. 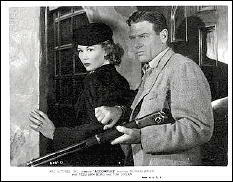 Richard Arlen’s many films are rarely seen today, and I’ve seen very few. A good one: THUNDERBOLT. Had never heard of this film. This is an interesting review!